JAILLOT - Le Comté de Zeelande . . .
JAILLOT, H. - Le Comté de Zeelande . . . Le Comté de Zeelande . . . - JAILLOT, H.
Title : Le Comté de Zeelande . . .. Size : 16.9 x 22.0 inches. / 43.0 x 56.0 cm. 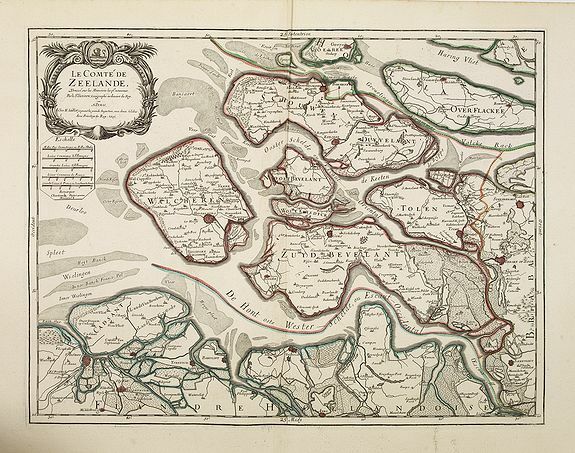 Description :Fine map of the province of Zeeland ornated with a rococo title cartouche with the coat of arms of Zeeland showing a lion half-emerged from water. Boundaries outlined in hand colour. The map is fully and richly engraved. Five distance scales within cartouches. The map notes Nicolas Sanson as the mapmaker and was published by Alexis-Hubert Jaillot (1632-1712). Condition : Printed on heavy paper. Good dark impression.